ON a day governors elected on the platform of the Peoples Democratic Party, PDP largely boycotted a peace parley scheduled to resolve their face-off with their National Chairman, Alhaji Bamanga Tukur, the PDP chairman warned, yesterday, that not one of the governors nor the president was bigger than the party. The warning from Alhaji Tukur came as it emerged that the ranks of the governors may finally have been broken by news of an alleged secret tape recording of a meeting of the governors which was allegedly transmitted through Tukur to the president. The tape was allegedly the basis for the presidency’s realization of the depth of ill-feelings among the governors towards the president. 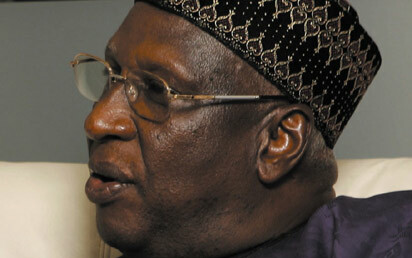 But Tukur’s camp quickly dismissed such speculation as nonsense. Speaking while receiving the party’s newest governor, Governor Mukhtar Yero of Kaduna State at the PDP national secretariat yesterday, Tukur warned the governors that power was transient. Tukur who was himself a governor 30 years ago, spoke against the background of the boycott of the scheduled peace meeting meant to reconcile the governors with Tukur over the face-off that arose from the crisis in the Adamawa State chapter of the party. Yero who ascended to the governorship following the death of Sir Patrick Yakowa, the immediate past governor of Kaduna State last December, was in the party secretariat to familarise himself with the national leadership of the party. He came along with his deputy, Nuhu Bajoga; the acting chairman of the state chapter of the PDP, Alhaji Isyaku Birni Gwari; business man Alhaji Sani Dauda; former Executive Secretary, Petroleum Technology Development Fund, PTDF, Hamisu Abubakar, among others. Tukur urged the governors, other elected government functionaries and the people to work towards ensuring that the institution of government was made very strong and not revolve round personalities. Tukur said: “As governors, we should all agree to move our people from the position of want to the position of plenty through empowering them by giving them education to defend and empower themselves. We as leaders of your party, our job is to ensure we support all actions being done to help the promotion and development of our people. “For us, the party is supreme, it is neither the NWC nor the president and the governors; let us build institutions, not personalities. It is the institution of the party itself that is supreme because all of us come in and go. All of us are birds of passage; we come, we go. Tukur who hailed the late Governor Patrick Yakowa of Kaduna, however stressed the need for peace in the country if development must be achieved in all its ramifications, Peace is important and peace cannot reign unless security is assured. “I am committed to reconciliation, without confrontation. We must run a party based on justice. Therefore, we must reach out to all – local councils, states, centre and the entire PDP family. Nothing that the late Yakowa was an epitome of peace, he urged Yero to strive and ensure that there was peace in the state as well as ensure that he works towards the unity and development of Kaduna State. Speaking earlier, Governor Mukhtar Yero, who declared his support for the party and Alhaji Bamanga Tukur led National Working Committee, NWC, also declared support for President Goodluck Jonathan. He admonished Nigerians to support the Federal Government, just as he disclosed that security would top his agenda for the people of Kaduna State. When asked if age would not deter him, he said: “Age is not the issue, it is the experience; I have been in government for a long time now, I have been a commissioner for three years and a deputy governor for two and a half years; I can say I know a lot about governance, so we would try our best to see how we can move forward. The governor hailed his predecessor as a perfect Nigerian with whom he had a good working relationship and who he said also taught him the elements of governance. According to him the late Yakowa left behind very big shoes. Governor Yero said: “We are here today, to commiserate with the entire PDP family over the death of our former governor. He was one of your sons who contributed greatly to this party. A great loss, not only to PDP, but the entire PDP family. “We had a very good working and personal relationship. He was a good man to work with, who made tremendous efforts to make us understand how the public sector works. So, we really missed his experience. “Secondly, we are here to introduce myself officially as the new governor of the state. We assure you of our loyal commitment to you and the cause of the party and the national working committee. Governor Yero’s presence at the PDP secretariat nonetheless, the majority of the governors were yesterday absent at the scheduled troubleshooting meeting of the governors with the NWC. In the absence of the governors Tukur, however, continued to receive solidarity visits from major stakeholders in the polity. One of the latest to visit him was the Asagba of Asaba, Obi Chike Edozien, who called at the national chairman’s residence in the Wuse 2 area of the federal capital. The visit was, however, described as personal given the fact that Tukur’s wife, Hajiya Fatima Tukur hails from Asaba. Meanwhile, a new twist was yesterday added to the lingering feud in the ruling party following an allegation that Tukur transmitted the recording of a secret meeting by its governors to President Jonathan. The allegation gained grounds with reports that one of the northern governors loyal to Tukur and Jonathan had made a secret recording of the meeting held by his colleagues and later passed same to the chairman who in turn presented same to the President. The tape, it was gathered, made it possible for Jonathan to understand the depth of the crisis in the party and the level of loyalty of each of the PDP governors to him and the national chairman. But Tukur promptly denounced the report, saying that he did not transmit any secret tape to the President, as claimed in the report. A source close to the chairman described the allegation of his involvement in the tape transmission to Mr. President as “utter fabrication, falsehood, and idle talk. The source quoted Tukur as saying that he was too occupied with effort to reorganize the party and bring about the needed unity and peace to think of engaging in frivolity. The source said, “For now the national chairman is too busy focusing on building unity and consensus and assisting government to provide good governance. According to Tukur, such claims were deliberately designed to cause disaffection within the ranks of PDP members.